Just days before the launch of House of Cards season 5, stars Kevin Spacey and Michael Kelly were photographed in character by former Chief Official White House photographer for President Obama and Ronald Reagan, Pete Souza, around Washington, DC. The shoot, showcases a day in the life of President Frank Underwood, following him and Chief of Staff, Doug Stamper, to some of the Capital's most iconic spots. "It was a pleasure working with Kevin and Michael and photographing them around some of D.C.'s most recognizable locations. Whether photographing the real President or a fictitious presidential character, it's an exciting experience. 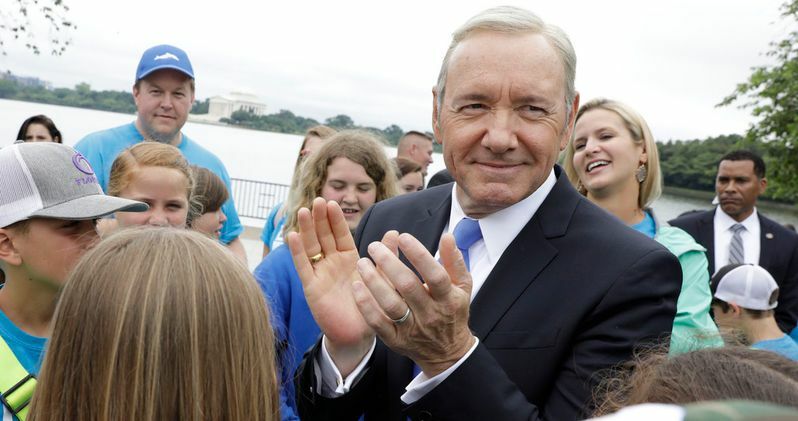 Frank Underwood's latest appearance around the nation's capital follows an unveiling of his portrait at the National Portrait Gallery last year, an event that Spacey attended in-character alongside Gallery Director, Kim Sajet, and members of the actual White House press corps. The portrait of House of Cards President Frank Underwood by British artist Jonathan Yeo was commissioned by the museum, which houses the only complete collection of presidential portraits outside of the White House. The Emmy®- and Golden Globe®-winning political drama House of Cards returns to Netflix for its anticipated fifth season. With tensions mounting in the White House, Frank Underwood (Kevin Spacey) and Claire Underwood (Robin Wright) continue to navigate their political careers and redefine their relationships - particularly with each other. All 13 episodes of the new season will become available to https://www.netflix.com/title/70178217|Netflix members worldwide on Tuesday, May 30, 2017, at 12:01 a.m. PT. Season four ends with the Underwoods promising to foment chaos and fear, and that's where we pick up in season five," says Melissa James Gibson, who serves as showrunner this season alongside Frank Pugliese. House of Cards cast also includes Michael Kelly, Jayne Atkinson, Neve Campbell, Derek Cecil, Paul Sparks and Joel Kinnaman. This season's new cast members include Patricia Clarkson, Campbell Scott, Korey Jackson and James Martinez.